When The Closer TV show ended in 2012, fans of the Kyra Sedgwick crime drama could take some solace knowing that many of the characters would stick around via the Major Crimes spin-off. Soon, it will be time to say goodbye to that series as well. 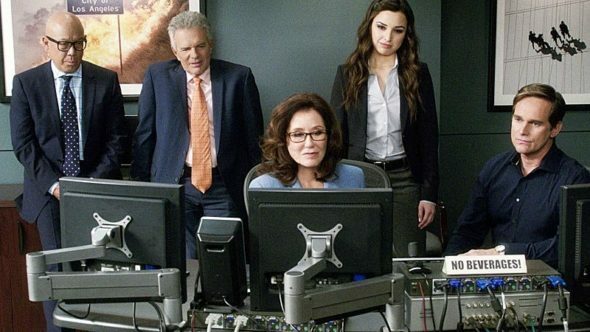 TNT has announced that a seventh season renewal won’t be coming for Major Crimes. The sixth and final season will kick off on Halloween, October 31st, at 9pm (ET/PT). The two-episode series finale will air on Tuesday, January 16, 2018. Television’s beloved squad of detectives will tackle their three final cases when TNT’s hit drama Major Crimes returns for its sixth and final season on Tuesday, Oct. 31, at 9 p.m. (ET/PT). The series, a spin-off of the critically-acclaimed hit, The Closer, features a stellar ensemble cast headed by two-time Oscar® nominee Mary McDonnell. Also starring are G.W. Bailey, Tony Denison, Michael Paul Chan, Raymond Cruz, Phillip P. Keene, Graham Patrick Martin, Kearran Giovanni, Jonathan Del Arco, Leonard Roberts, Jessica Meraz and Daniel di Tomasso. This season, the hugely popular crime drama marks its 100th episode milestone on Dec. 19 with the two-episode series finale airing on Tuesday, Jan. 16, at 9 p.m. (ET/PT). What do you think? Are you a fan of the Major Crimes TV show? Is this the right time to end the series? Would you have watched season seven? This was a great show!! I’ll really miss it!! What a stupid move TNT. Shame on the people responsible for ending one of the best programs in the history of television! Let us boycott TNT! This was a popular show with many interested in this genre. The strong cast, creative and thoughtful plots, character relationships made it a success. Terminating it, TNT loses one of its best quality draws for a police procedural with depth. They did not have many programs with a loyal viewer base and blew it in my opinion. Good bye TNT. I wish it would never end. The chemistry is amazing! Love the characters & all the personal back & forth. Wish miss all of the characters for a LONG time. Yes I would have watched season 7 absolutely loved the show. We love Major Crimes. We found it late & are watching every episode on Bravo to catch up!!!! Great show!!!! Sure wish you wouldn’t cancel it. Yes I would have watched season 7. I love this show. Love the cast. I’m gonna be sad when it ends. I enjoyed it the cast was great together. I hated to see it end The handling of Shannon’s death and service was well done I cried. Some how I missed the very last one and can not find it on demand and can not believe we are being changed to see the shows. will they rerun the last ones?